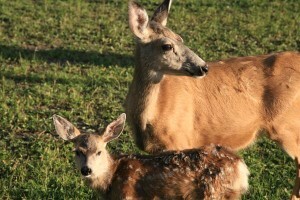 Mule deer are common throughout the townsite of Waterton Village. Wildlife viewing in the park requires patience and a little know-how, but the rewards are ample, as good as anywhere in the Canadian Rockies. Elk inhabit the park year-round. A large herd gathers by Entrance Road in late fall, wintering on the lowlands. By early fall, many mule deer are wandering around town. Bighorn sheep are often seen on the north side of Blakiston Valley or on the slopes above the Waterton Visitor Centre; occasionally they end up in town. White-tailed deer are best viewed along Red Rock Canyon Parkway. The park has a small population of moose, occasionally seen in low-lying wetlands. Mountain goats rarely leave the high peaks of the backcountry, but from Goat, Crypt, or Bertha Lake you might catch a glimpse of one high above you. The most common predators in the park are the coyotes, which spend their summer days chasing ground squirrels around the prairie and parkland areas. For its size, Waterton has a healthy population of cougars, but these shy, solitary animals are rarely seen. About 50 black bears live in the park. They spend most of the summer in the heavily forested montane regions. During August and September, scan the slopes of Blakiston Valley, where the bears can often be seen feasting on saskatoon berries before going into winter hibernation. Much larger than black bears are grizzlies, which roam the entire backcountry but are rarely encountered. Larger even still are bison. Although these prairie dwellers never lived in the mountains, they would have grazed around the eastern outskirts of what is now the park. A small herd is contained in the Bison Paddock, just before the park gate. Golden-mantled ground squirrels live on the Bear’s Hump and around Cameron Falls. Columbian ground squirrels are just about everywhere. Chipmunks scamper about on Bertha Lake Trail. The best time for viewing beavers is at dawn and dusk along the Belly River. Muskrats can be seen on the edges of Maskinonge Lake eating bulrushes. Mink also live at the lake but are seen only by those with patience. Two major flyways pass the park, and September to November many thousands of waterfowl stop on Maskinonge and Lower Waterton Lakes. On a power-line pole beside the entrance to the park is an active osprey nest—ask staff to point it out for you. Waterton Heritage Centre has a great little free checklist for birders listing the 250 species recorded within park boundaries. An abundance of wildlife is one of the biggest draws of the Canadian Rockies. To help preserve this precious resource, obey fishing and hunting regulations and use common sense. Do not feed the animals. Many animals may seem tame, but feeding them endangers yourself, the animal, and other visitors, as animals become aggressive when looking for handouts (even the smallest critters, such as squirrels). Store food safely. When camping, keep food in your vehicle or out of reach of animals. Just leaving it in a cooler isn’t good enough. Keep your distance. Although it’s tempting to get close to wildlife for a better look or a photograph, it disturbs the animal and, in many cases, can be dangerous. Drive carefully. The most common cause of premature death for larger mammals is being hit by vehicles.